We often associate cars with locations because certain vehicles encapsulate the essence of a particular state or city. The Ford F-150 and Texas is a good example of this. The Toyota Prius and Las Vegas? Not so much. Regardless of the connection, Sin City is where Toyota has chosen to unveil the all-new 2016 Prius, and Digital Trends will be there reporting live. The event is media only, though, so the brand has set up a livestream link where hybrid fans and critics alike can see the sheets come off with the rest of us. The event kicks off at 8:55 p.m. PDT on Sept. 8, and you can watch it below. 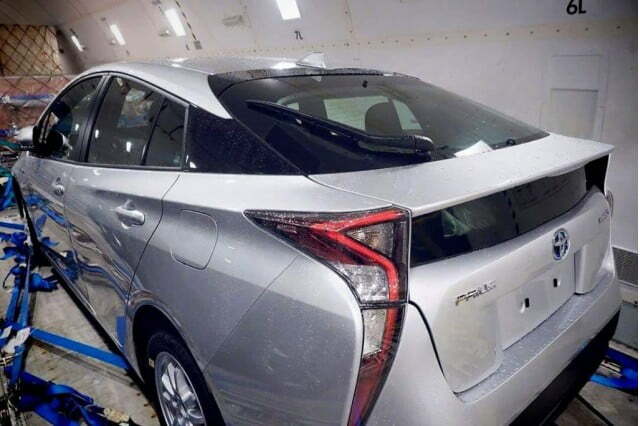 As you can see from the leaked photos, the fourth-generation Prius will boast a new, ultra-modern look with styling cues taken from the Mirai hydrogen car and even the Lexus LFA. The car will reportedly ride on Toyota’s New Global Architecture (TNGA) as well, which means it will be lighter and more efficient than the current model. Conformation won’t come until the reveal, but the Prius is expected to feature an upgraded battery back, improved fuel efficiency to over 50 mpg, and an electric range that encompasses the current car’s EV capability of 11 miles. Optional all-wheel drive is a good bet as well, as is a revamped interior, inductive charging capabilities, and a more powerful engine. The 2015 model year Prius boasts a combined output of 134 horsepower, but the 2016 variant could see that number increase to 145 or 150 horsepower. Whatever engine lies under the Prius’ hood, it will transfer power to the ground via a continuously variable transmission with four modes: Normal, Power, Eco, and EV. For more, keep it locked right here as we inch toward the all-new Prius’ unveiling.